MKV File Converter is a free video converter for MKV video files, it can convert MKV videos to MP4 videos and AVI videos, or convert other videos to MKV videos. Software have a friendly interface, simple and easy to use. 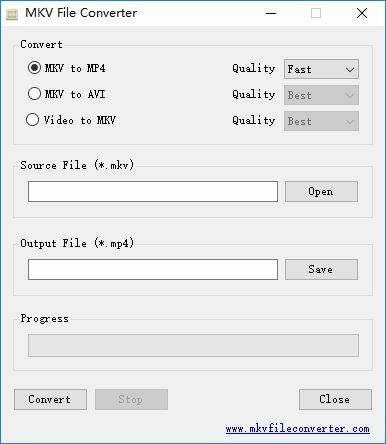 Choose the video conversion you need, set video quality, then press "Open" button to select a source video file, software will automatically prompt an output file name, if necessary, you can press "Save" button to set another output file name. Finally, click "Convert" button to start. During video conversion process, software will display current conversion progress with a progress bar. MP4 (MPEG-4) is the most popular video format, you can use software convert MKV videos to normal MP4 videos. This conversion supports three video quality options: Fast, Normal and Best. Fast option, this is default option, software will only "Copy" video data from MKV container to MP4 container, audio data will be re-encoded as AAC encoding. Normal option, software will re-encode video data and audio data, output file maybe smaller than other video quality option, but output video may not be as clear as source video file. Best option, software will re-encode video data and audio data, it will set video bit-rate same with source file, software will try keep the best video quality, output file will be bigger, but it should be as clear as source video file. AVI is another popular multimedia container format introduced by Microsoft. Software provides two video quality options: Best and Normal. With the Best option, software will try keep the best video quality, audio data will be re-encoded as MP2 encoding. Software can help you to create MKV videos from other videos, such as MP4, AVI, WMV, FLV, 3GP, MOV and more. Software also provides two video quality options: Best and Normal. The default option is Best, software will try keep the best video quality. The generated MKV videos will use MP3 audio encoding, make sure it can be played on both mobile phones and PCs. Copyright (c) 2017 MKVFILECONVERTER.COM, All Rights Reserved.